BEIJING, June 20 -- Xi Jinping, general secretary of the Central Committee of the Communist Party of China (CPC) and Chinese president, met with Kim Jong Un, chairman of the Workers' Party of Korea (WPK) and chairman of the State Affairs Commission of the Democratic People's Republic of Korea (DPRK), at the Diaoyutai State Guesthouse in Beijing on Wednesday. The two leaders had an in-depth conversation over tea in a cordial and friendly atmosphere. "We are pleased to see that the important consensus reached by China and the DPRK is gradually being implemented, the friendly cooperative relations between the two sides are radiating new vitality, the momentum for dialogue and easing of situation on the Korean Peninsula has been effectively strengthened, and the WPK's new strategic route has pushed the DPRK's socialist cause into a new journey," Xi said. He said he believes that under the joint efforts of both sides, China-DPRK relations will certainly benefit the two countries and the two peoples. With joint efforts of China, the DPRK and related parties, the Korean Peninsula and the Northeast Asia will surely embrace the bright prospects of peace, stability, development and prosperity, said Xi. Xi said that socialism with Chinese characteristics has entered a new era. The CPC and people of all ethnic groups in China are closely united around the CPC Central Committee to strive for the achievement of the Two Centenary Goals and the Chinese Dream of the great rejuvenation of the Chinese nation. China is willing to share its experience with the DPRK, and strengthen unity and cooperation to jointly create a better future for the socialist cause of the two countries, said Xi. 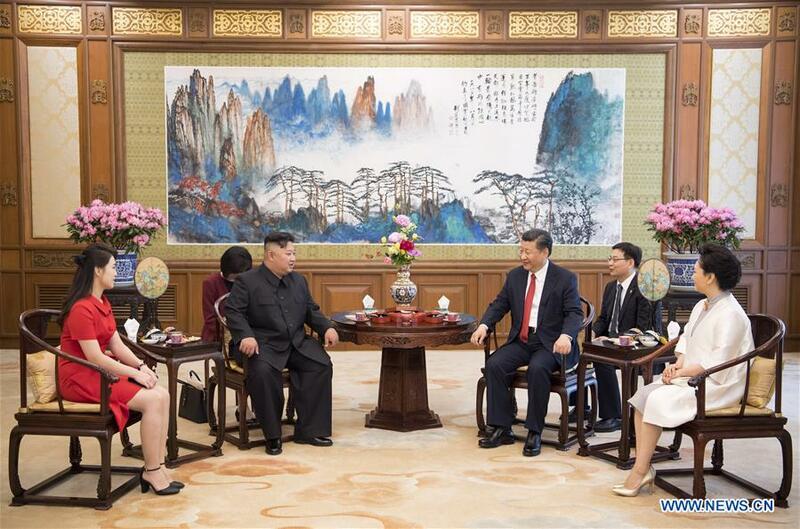 Kim said the two countries are as close and friendly as family, and help each other, adding that Xi has offered affectionate care and support for the DPRK people. The current visit to China has served as an opportunity to deepen the friendship between comrade general secretary and I, and advance DPRK-China ties, Kim said. He vowed to work with Chinese comrades to upgrade bilateral ties to a new high, and play their due roles in safeguarding world and regional peace and stability. Kim said he believed that under the strong leadership of the CPC Central Committee with Xi at the core, and the guidance of Xi Jinping Thought on Socialism with Chinese Characteristics for a New Era, the Chinese Dream of the great rejuvenation of the Chinese nation will definitely be realized. Xi's wife Peng Liyuan and Kim's wife Ri Sol Ju also attended the meeting. After the meeting, Xi and Peng held a luncheon for Kim and Ri. On Wednesday, Kim visited a national agricultural technology innovation park under the Chinese Academy of Agricultural Sciences, and the Beijing rail traffic control center. Cai Qi, member of the Political Bureau of the CPC Central Committee and secretary of the CPC Beijing Municipal Committee, accompanied Kim on his tour.